Oh, Florida. What are we going to do with you? While you've been relatively quiet this year compared to the bath salt-fueled insanityfest that was 2012, every now and then you do something that makes the rest of us scratch our heads. This is one of those times. 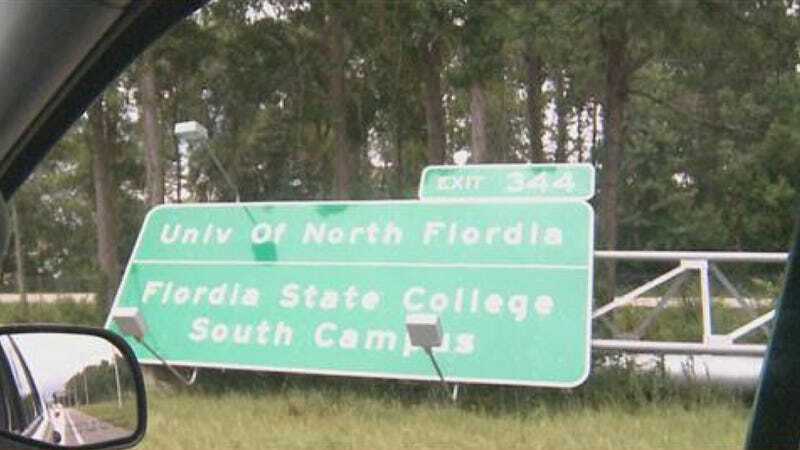 Unless I missed the news story where the legislature decided to change their title to "Flordia" for PR reasons, a sign installed on Interstate 95 spells the state's name wrong. But let's not be too quick to pile on the Sunshine State here. According to First Coast News, it's actually Arkansas' fault. (Ha!) A contractor there misspelled the name on the sign and has agreed to fix it at no cost to taxpayers. Regardless of fault, I think we can all agree that this is an appropriately Florida thing to happen. Or should I say Flordia. That has a nice ring to it. Hat tip to Erin Gloria Ryan!